India’s prime-time TV presenter Arnab Goswami has sparked a social media frenzy with the news he is leaving the country’s top English-language channel. Goswami is a household name, famous for his loud, fast-paced news show and habit of interrupting guests with the phrase, “the nation wants to know”. Many social media users are speculating on why he might leave his job, with his name the top Twitter trend in India. Goswami has not given a reason and his employer has yet to confirm the news. His signature style quickly propelled him to the status of national icon at Times Now, where he was editor-in-chief and also the host of the channel’s popular Newshour programme. His show’s style meant guests and host frequently talked over one another – prompting many tongue-in-cheek social media messages about his departure. He was not, however, universally popular. Reacting to the news on Tuesday, the Indian Express wrote that Goswami was”often criticised for being judgmental on his news show”. 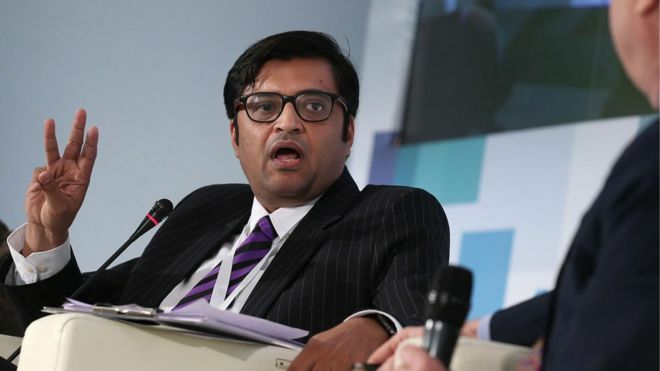 “Arnab has a dedicated viewer base of people who love his direct interrogative style of debates, and also those who hate him,” the newspaper explained. Speaking to the BBC, a source in Times Now confirmed local media reports that he had announced his resignation at a staff meeting earlier on Tuesday. However, there has been no official confirmation from the company, who were running teasers on Tuesday about his return to the channel after several days’ absence. At 21:00 local time, when Newshour aired, Goswami appeared to his captive audience – but left little clue about his future at the end of the show. Indian media, though, are widely reporting that the famous anchor is set to embark on his own news venture – possibly in conjunction with the Rupert Murdoch news empire, News UK. Another report carried by outlet The Quint quoted Goswami, via a second-hand source, as saying his new project would be “formidable competition to the BBC and CNN”.